Bunn's Bank is a fragmentary earthwork that runs for about two miles along the south and east of the parish. No one knows exactly how old the embankment is, but it could be early Saxon in date. The locals, however, say that it was built by King Edmund in the 9th century, to help defend his 'royal town' against the marauding Danes. (See also 'Edmund of East Anglia'). Source: White's 'History, Gazetteer & and Directory of Norfolk' (1854). 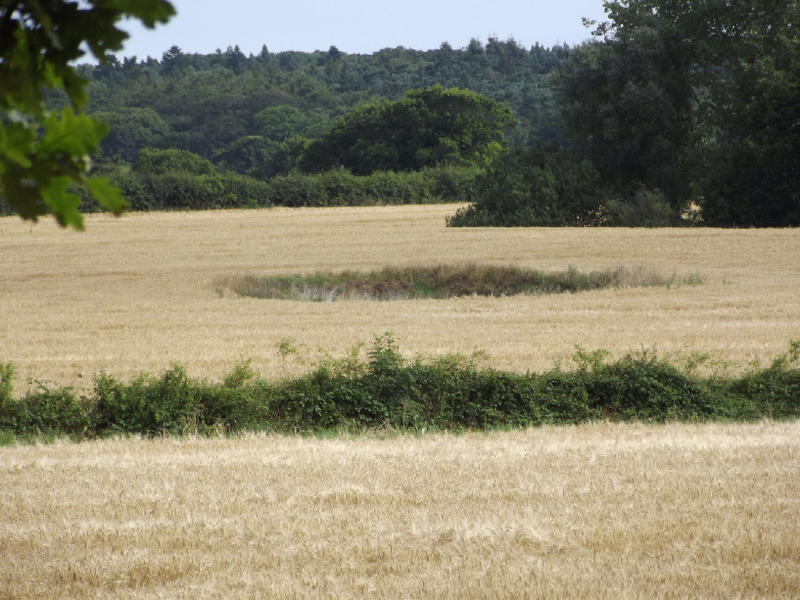 Although fewer in number nowadays, all over the area encompassed by Aylmerton, Runton, Beeston Regis and Weybourne can be seen shallow pits in the fields, once thought to be prehistoric dwellings. In fact they are early medieval in origin, dating from the 9th to late 11th centuries, and were created by digging for iron ore for smelting on site. Except at Aylmerton, they are marked on Ordnance Survey maps as 'Iron Workings'. A few are visible in the parish of Aylmerton in the fields just north and west of Gresham Cross (TG181388), and these are the ones known as the Shrieking Pits. The tall phantom of a woman in white is said to wander around these pits, sometimes peering into them, but all the while wringing her hands and moaning or shrieking. When the pits were thought be be prehistoric, she was believed to be the ghost of a Stone Age Woman. Now, some say she is the spirit of a mother looking for her baby. The infant was murdered by her jealous husband, who was convinced that it wasn't his. After burying the baby in the pit west of Aylmerton church, he went back and murdered his wife. Obviously the same apparition, the ghost of a woman in a 'winding sheet' is said to rise out of the ground and roam the 'Hills and Holes' of the Weybourne area. Here, some have said that the pits were made by Cromwell when he destroyed Weybourne Priory. Similar hollows, again thought connected with iron working, can be seen at Northrepps, where they are also known as Shrieking Pits - one of which also has its own legend. W. A. Dutt: 'Highways & Byways in East Anglia' (Macmillan & Co, 1923), p.219. Christopher Marlowe: 'People & Places in Marshland' (Cecil Palmer, 1927), pp.169-70. W. B. Gerish: 'Norfolk Folklore Collections', Vol.4 (unpublished, 1916-18, compiled by William de Castre), p.265. The golden wheel of a chariot is said to be buried in the Heater Field (TG167253), a small triangular plot (now occupied by a house and riding centre) about two miles out of town on the road to Cawston, where it meets a lane from Frog's Hall. Source: John Sapwell: 'History of Aylsham' (Rigby Printing Co, 1960), p.141.